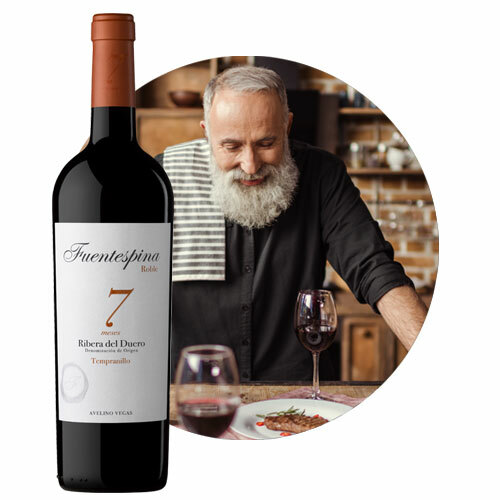 Fuentespina 7 - Fuentespina & Montespina Wines. D.O. Ribera del Duero y Rueda (Spain). Coming from vineyards with an average age of 50 years and with an ageing of 7 months in new American oak barrels. Fuentespina 7, Ribera del Duero in its purest form. Try it with mushrooms and fungi, grilled fish, red meats, small game and semi-cured cheeses. Very expressive; notes of red and black fruits are mixed with hints of vanilla, lactic and roasted coffee notes. Powerful, pleasant, enveloping, very soft, with a long, fresh finish.